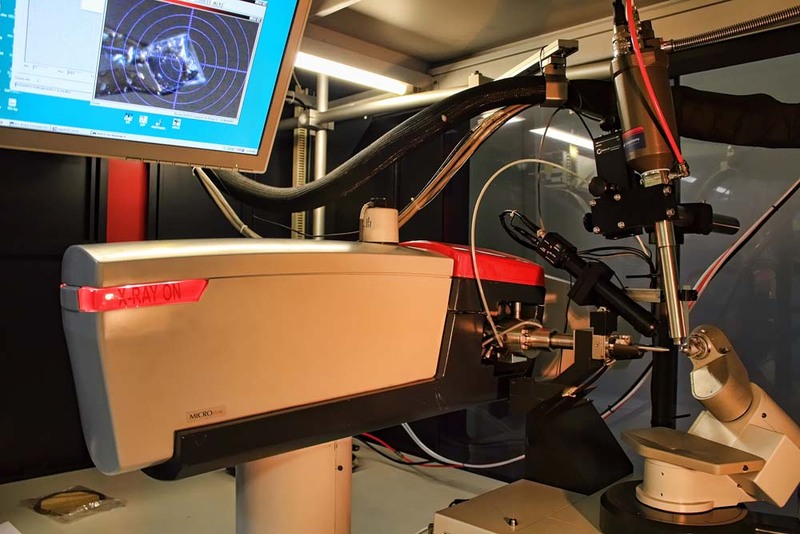 X-Ray diffraction is the main technique for determining the three dimensional structure of molecules at the atomic scale in fields as relevant as Mineralogy, Organic and Inorganic Chemistry, Pharmacology, Biochemistry and physics of materials. The Crystallisation Factory counts with two diffractometers, one for the collection of data of single crystals of macromolecules and other for small molecules. A Bruker X8 Proteum diffractometer with a Cu rotating anode generator, Montel optics and a Smart 6000 CCD detector. 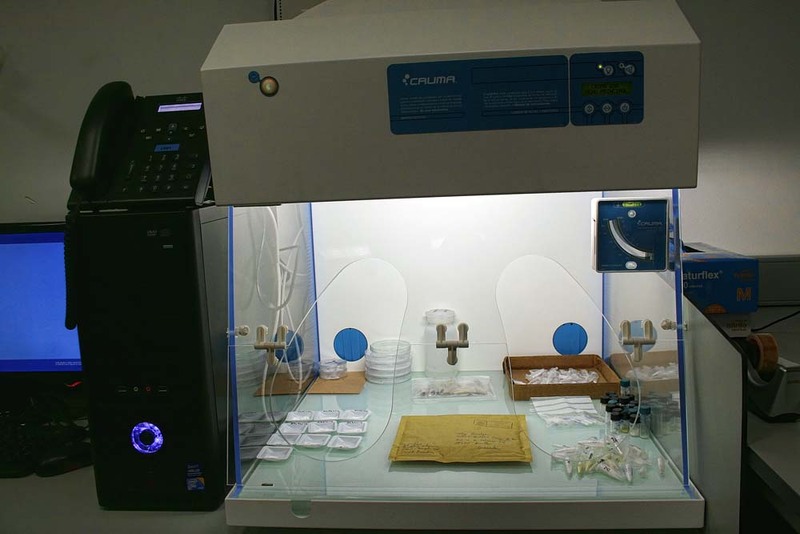 This instrument is outfitted with an Oxford Cryostream Low temperature device, which enables temperature range from 80 to 400 K. The facility contains a crystal workstation, equipped with high definition microscopes, which provides all the necessary tools to select/mount room temperature or cryo-cooled samples. There are also dedicated computers for structural analysis. A new state-of-the-art diffractometer with hi-flux dual wavelength microsources, a big format detector and low temperature cryostat, will be available in the autumn. 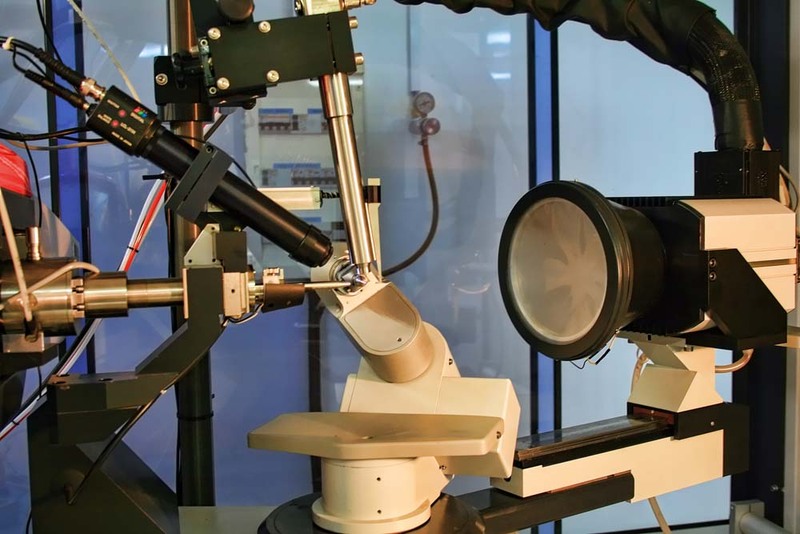 The facility contains a crystal workstation, equipped with high definition microscopes, which provides all the necessary tools to select/mount room temperature or cryo-cooled samples. There are also dedicated computers for structural analysis. In the X-Ray Diffraction facility is possible to select the service according to specific needs, ranging from the simple collection of data to the full structure characterisation. Diffraction test and unit cell determination: Includes sample preparation, selection and mounting of crystals and unit cell determination. Data collection: Data collection can be requested either at room Tª (298 K) or at low Tª (N2, 120 K). Crystal structure determination: A report including the validated CIF is generated. Full structure characterisation: This is the most complete service, which includes the selection and mounting of the crystal, data collection (room temperature or low temperature), determination of the unit cell and crystal structure determination. Optional: Structure analysis.